Well, I don’t need to explore my title more as it will easily convince about what I am going to write on. But, before we start let me acquaint you with the term “Watermark”. Watermark is a simple way of identifying images and securing them from piracy and unauthorized use online. The watermark is a visible embedded overlay on a digital photo including text or a logo, or a copyright notice. The purpose of a watermark is to identify the work and decrease its unauthorized use. But remember, a watermark can also be removed with lots of time and patients but you don’t need to worry about it. You can deal with it. 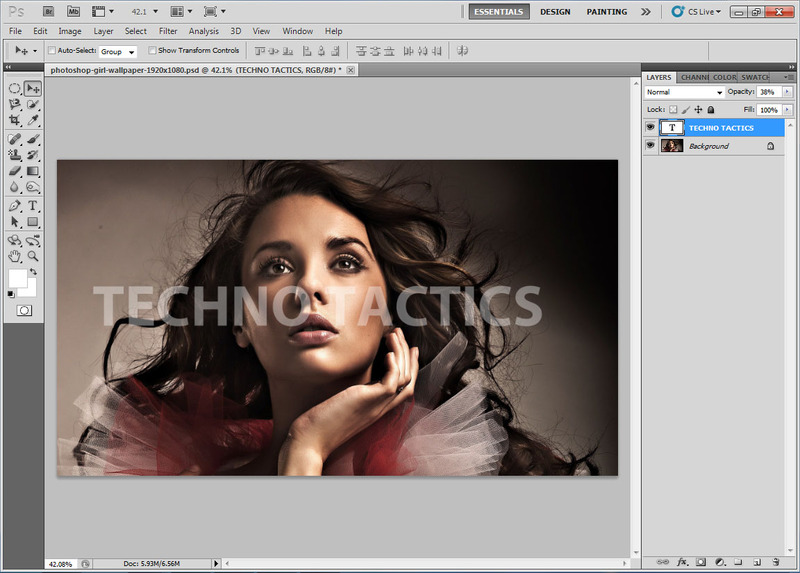 Here is the tutorial showing how to add watermark into your image using Photoshop. Let us commence with the tutorial for the same. With the hope that this article will turn out to be of some real use to you all. Step 1: Alright, First of all you need to choose an image on which you want your ‘Watermark’. 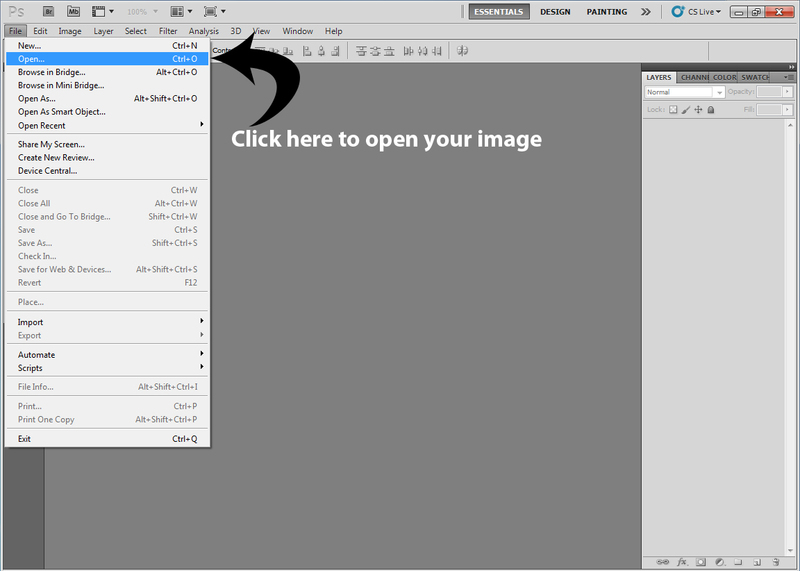 You can either Drag an image into Photoshop or you can go to File >Open and Open your image. 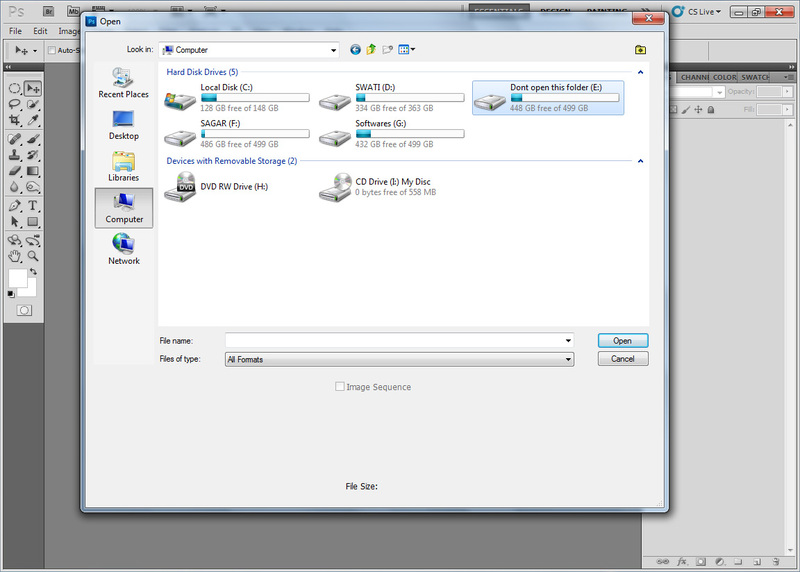 Step 2: Open the Image wherever you’ve stored it. 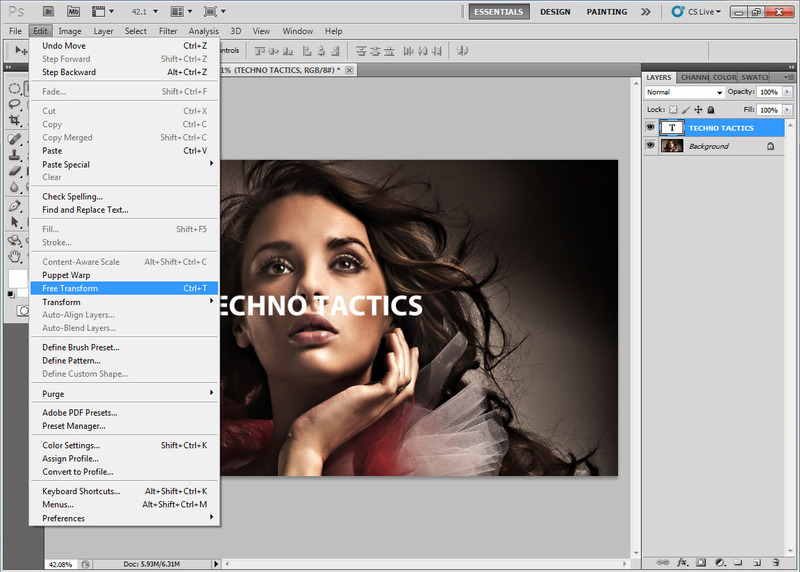 Step 3: Alright, Now you have opened your image in Photoshop. Now you need to write the watermark on it. So go to Horizontal Type Tool and long press the left click. It will show you four options. 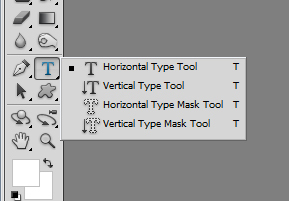 Choose Horizontal Type Tool to write Horizontally and Vertical Type Tool to write Vertically. Make sure you have selected White color in your Foreground Color. 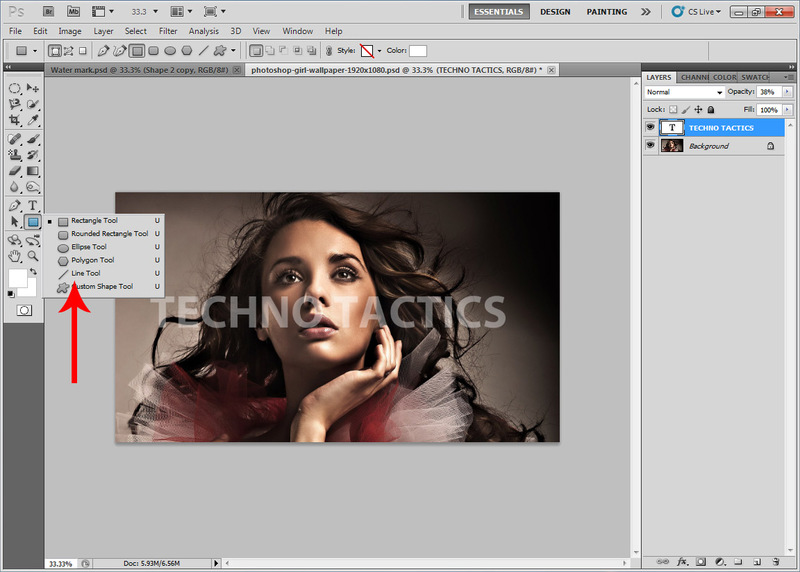 Step 4: Now write whatever watermark you want on your image. Step 5: After you have written your text you need to re-size or re-position it. So go to Move tool or press ‘V’. Step 6: Now to re-size your text you can select the text, double clicking on ‘T’ (Text) layer and changing the text point (pt) values. Or you can select Edit >Free Transform (Ctrl+T). It will show you 8 points so you can transform or re-size as you want. Step 7: We are done with the text now. 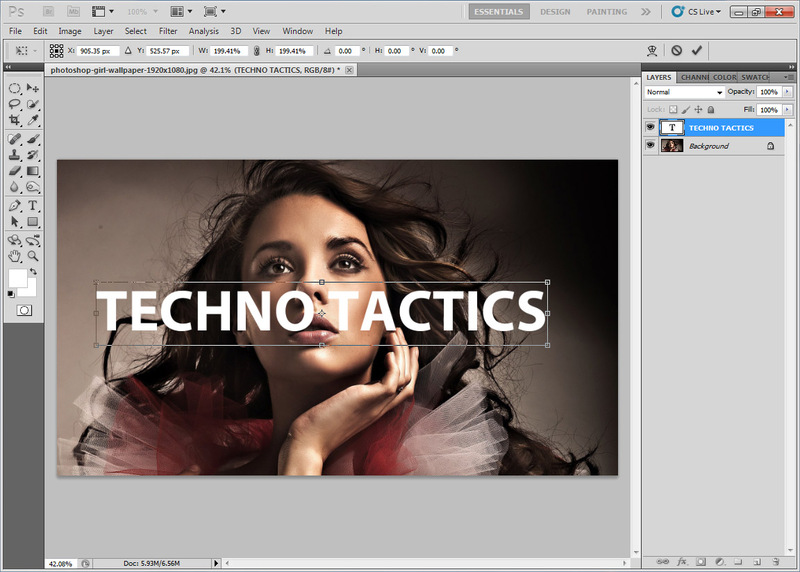 So to decrease the visibility of the text and transform it into the watermark, we need to reduce the opacity. 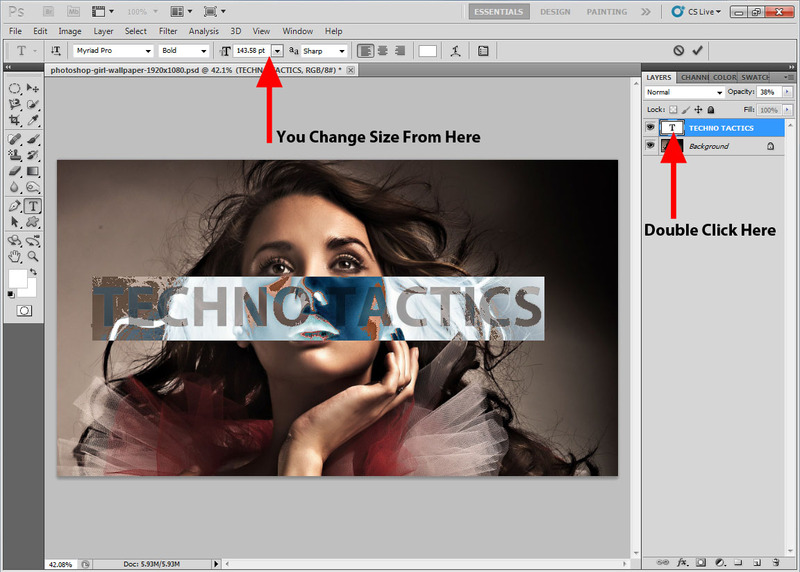 Which you can do by selecting the text layer and changing Opacity to 30 or you can play with it till you don’t get the best watermark for your image. And you are done with simple Watermarking. Alright, Suppose If your image is too precious and you don’t believe in simple Watermark… HERE WE GO! Simple and Effective! Step 8: Go to Shape Tool and select Line Tool. Now with pressing Shift key on Windows and as well as on Mac, draw line on your image that covers the whole image. You can draw as much lines you want but, don’t draw too much or very few. Step 9: Now you may see many layers of lines are created so you need to select them all. 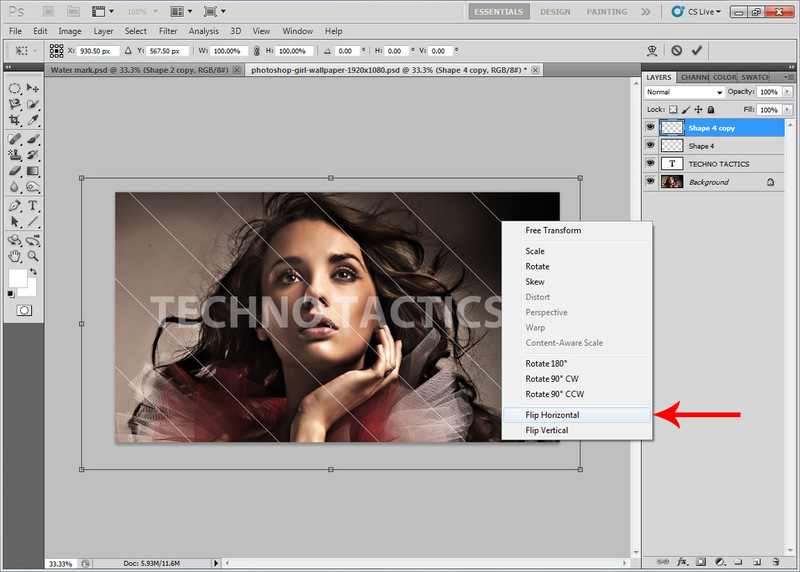 After Right clicking on selected layers, you will see the last third option ‘Merge Layers’. So just click on it and merge them all that you won’t be confused and it will be easy to move. Now this is done with Advanced watermarking but… We can also go a little bit further too! Step 10: Right click on Line layer which we’ve just made and select Duplicate Layer option (Ctrl +J). It will make the copy of the same line layer. Step 11: Now select the line layer which we’ve just created and press (Ctrl +T) or go to Edit >Free Transform. Now Press Right Click on line on the image and you will see ‘Flip Horizontal’ option at second last. Click on it and it will make square pattern on your image. Now your image will look like this!! Great and detailed Tutorial about watermarks! I love watermarks and how they identify the image but I didn’t know that they are used to secure an image from unauthorized use online. Great to know this from here. Thanks Sagar for taking the time to put together this tutorial for us. Thanks for your first comment on my article. I appreciate your about my article. I glad that now you know that watermark is for protecting your image on internet. I hope you will use watermarks for your images. Thank you for stopping by and have a look on my article. Yes, I agree with you that watermark is to identifying images and securing them from piracy and unauthorized use online. And you wrote a wonderful article about it. Keep writing such Articles. I have just learned how to add WaterMark, Just i got to know the basic, I have saved this article in my folder. Thanks for sharing. While I do use Photoshop but I really don’t like the layers we have to work with as they sometimes tend to confuse us a little – don’t they? Yes, that’s the case with newbies I guess as for experts, they are quick at working their way right through. I need to try this out with one of my images as I haven’t used them as watermarks as such as yet. Thanks for your feedback and I am glad that you like my tutorial. Simple way to customize the image and ingrain my name on any image!!! I always wondered how people are able to do it, searched but never tried my self. With these step by step process, I think I will give it a shot for sure in near future. I wish you luck to make your own watermark on your image by yourself. I tried to make it as simple as I could so everyone who ain’t familiar with Photoshop, they can also put a simple watermark on images and protect them. 🙂 Thanks for your feedback, it makes me to make some more useful tutorials. 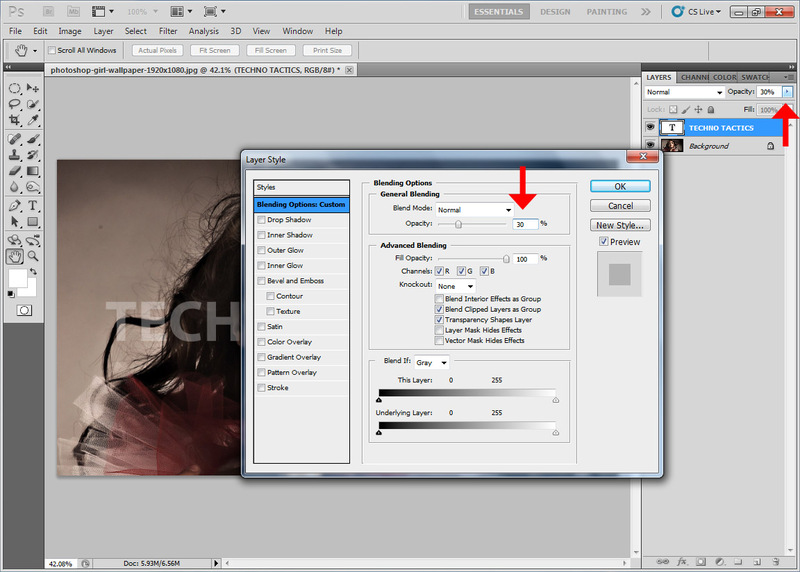 Great tutorial on adding watermark to images using Photoshop. I’m not an expert at editing on Photoshop but gonna try this out for sure. I’ve not started using watermark on my images right now, but I’m gonna start using soon. I’m going to bookmark this post so that I can come back and follow the methods later when I want to add watermark. Glad to hear that you’re gonna use this tutorial for your image by bookmarking this post. 🙂 Keep visiting for new updates. Watermark is especially great whe you create an infographic. It shows who’s the creator of it and if anyone uses ot people still see the author’s credentials. Yes! You are right. That’s what watermarks are for! Stay in touch. Currently, I am using FastStone Image Viewer for watermarking my blog images and it is working quite good for me. But, photoshop seems to be better. Your tutorial is really detailed and I am gonna try it out. 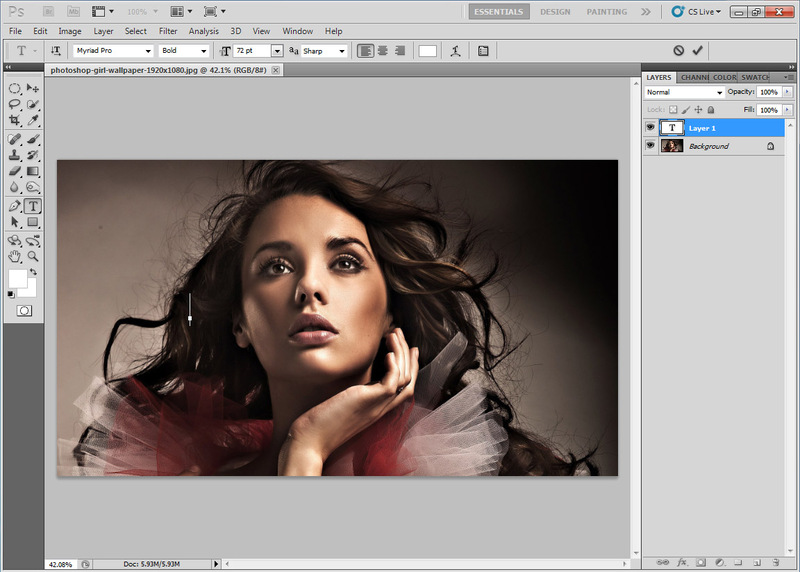 I am agree that you use FastStone but Photoshop can do more advanced works. I am glad that you will try PS too and I wish you to make some great Watermarks. Wow! you did it so nice and attractive at the end. Having some PhotoShop skills is really a great asset to bloggers. Thanks Sagar for sharing the tips. Thank you so much and I tried to make it so simple but attractive as well. I am glad you like it. Keep coming by in future. Nice and easy to follow tutorial on adding watermark for images using Photoshop 🙂 You have made it simple with clear instructions. Watermarks can prevent or minimize unauthorized usage of images 🙂 Well, obviously the image is solely owned by the person, else copyright issues will arise. However I think there are different perspectives on using watermarks ’cause it can ruin the image rather than protecting it 🙂 Anyway I prefer without having the watermark in middle of the image though. But of course, it’s subjective. Yes, This Quite Helpful For Beginners :).. I am glad that you are a great fan of photoshop. As you know that photoshop is an image editing software so you can do anything with an image as well as you can also create water marks too! Keep coming by for more awesome posts! Awesome post, well its really important to use water marked images to prevent the copying of our own created images or we can also promote our blog by watermarking them. Hello Sarvesh, I am really glad that you like this post and you are right, Watermark is really important on your own image. Keep coming by for some new posts like this. i was just loolling for this in google and found your blog and get fully awesome and easy post thnx man. Simple yet effective, a good way to save your images from piracy online thanks Sagar! Yes Sagar, Online protection of our materials like article, images are very important. watermark shows the deep impact on readers thinking about our site. The watermark indicates the authority of the site on the particular images. It is very simple way to promote website name in google images also. You have discussed very good tip for your users especially new bloggers like me. once again Thank you for this tutorial. I am glad that My article helped you. I will also write some articles on How to create Logo Design and many more! From several days I was looking to learn that how I can add watermark to my image using Photoshop and finally your this lesson has assisted me. I’m now going now give it a try. Thank you! I am feeling really Happy that my article is helping everyone! Thanks for stopping by! It is a good news that you recently entered into image editing world and learning new things! I am glad that my article helped you and I hope you will be creating Watermarks by yourself. Keep passing by for more interesting updates. It is a good site for sharing best photography with us.It is better site for the benefit. 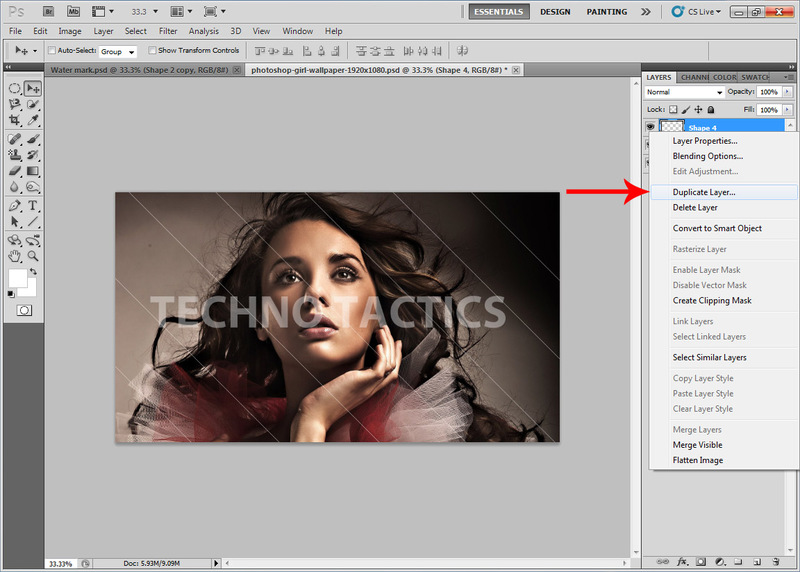 That’s a well explained tutorial for creating watermarks using photoshop. I love photoshop too! Keep spreading the Love! Thank you. Gimp was being a pain so now I can use photo shop. pretty much useful and long post. Thanks for sharing. urgently need it. is this feature is included in photoshop trial version?